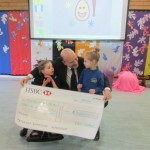 Richard Leachman, District Manager of Lodge Brothers Shepperton, is seen here presenting a cheque for over £300 to the ‘Manor Mead School’ located in the village. ‘Manor Mead’ is a Special Needs School, catering for children with severe learning difficulties (http://www.manor-mead.surrey.sch.uk) and the money raised will go towards the cost of some special equipment which enables children to operate a computer with their eyes alone. Richard and his team at Lodge Brothers (Lindsay and Barry Tuckfield and Kate Thulborn) raised the money at the recent ‘Big Tree Night’ event in the High Street in Shepperton. “It’s great”, Richard explained, “to be able to help such a fantastic cause in our local community. I want to thank Tracey, the head-teacher at Manor Mead, for showing me around her wonderful school, and for the welcome I received from the staff and children alike”. Richard is seen in the photograph with two of the children at the school, Megan and Eleanor.